The Argus Group today announces that it has made a financial donation to The Berkeley Institute for registration fees for 12 students in S3 and S4 to write the Association of Chartered Certified Accountants (ACCA) Entry Level 1 exam. The Association of Chartered Certified Accountants Foundations is an entry-level suite of awards, including certificates and diplomas. If passed, the Entry Level 1 exam will provide students with an Introductory Certificate in Financial and Management Accounting. The certificate is suitable for those who wish to pursue an introductory qualification in accounting and finance. To achieve the Introductory Certificate in Financial Management Accounting students must complete two computer based exams and a Foundations in Professionalism module. The exams are in recording financial transactions and management information. 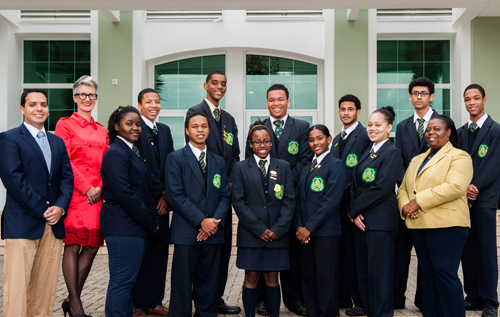 The students will take the Association of Chartered Certified Accountants Entry Level 1 exam on February 12 and 13 at Bermuda College.